We scour Europe for the most innovative pre-seed and seed stage companies to join the Seedcamp Nation. 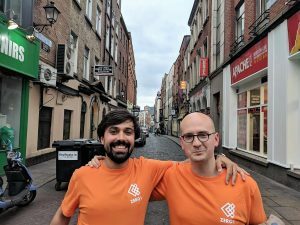 We’re excited to back Ramiro, Jose and Ernesto, co-founders of Zero1, an ambitious team out of Spain providing early supply chain financing to help businesses thrive. We sat down with CEO, Ramiro, to talk more about the inspiration behind Zero1 and why they came to Seedcamp to help them achieve their long-term vision. Ramiro, explain to us what you’re building at Zero1? We are making it easy for businesses to finance their growth, allowing them to focus on their products and customers. To do so, we are building a web platform and scoring model adapted to modern supply chains, taking into account the relationship between buyers and seller as well as the supply chain milestones. These allow us to better assess the risk and make the whole process of obtaining financing for purchase orders much easier, faster, and without obscure conditions attached. Tell me more about your background and what inspired you to create Zero 1 and who you’re building it with? A couple of years ago I was in India working on a project to improve supply chain operations. However, due to delay in payments the suppliers were unable to invest in new more efficient technologies. As a result, everyone was worse off: the buyer, the suppliers, and the consumers. That was my lightbulb moment. Back in Spain Jose, who loves everything finance, was getting interested in invoice factoring—providing financing to SMEs based on invoices they have submitted. After weeks of research and long phone calls, we were frustrated by the limitations in the sector: Late funding, after the invoice is submitted, does not help SMEs fulfil their orders from MNCs, and hence issue an invoice. Many end up failing due to lack of access to capital. That is when the second lightbulb went off—what if we provided the funding earlier, based on the Purchase Order (PO) from the MNC, rather than the invoice, and looking at their historical relationship? Supply Chain financing for small businesses based on POs is not a new idea as both the World Economic Forum and the World Bank have pointed out, but it is not being provided efficiently. Banks, alternative online lenders, government programs, and NGOs are filling the need partially, but the estimated “funding gap” needed by SMEs is in the trillions of USD globally. Put another way, an estimated 500 million people are affected by a lack of SC financing. The few players targeting this segment are reporting growth rates of 30–40% per year in SC financing. Clearly, solutions like Zero1 are needed. We are three complementary co-founders: Ernesto (our hacker CTO), Jose (finance wizard) and myself, with experience in consulting and supply chain. Together we are ready to help close the Supply Chain financing gap. The key is bringing buyers onboard, which allows us to validate the purchase orders and invoices and to analyse the suppliers using our machine learning algorithms. Then, as new purchase orders are issued, suppliers can automatically obtain financing through our online platform, without any complicated software to be adopted but rather in a fully automated and seamless manner. If another such transition to a different growth model were to occur, and it was of similar magnitude to the previous two, it would result in a new growth regime in which the world economy would double in size about every two weeks. We want Zero1 to pave the way for a new generation of business banking that can support the world economy. In 2-3 years, we want to have a fully automated software where suppliers, buyers, and lenders can automatically join Zero1. SMEs will have the funds needed to undertake new projects, hire new workers, and expand their operations. Investors will have the ability to gain exposure to economies and sectors at a much more granular level, supporting ideas and businesses they believe in. Buyers will leverage their data and have a more resilient, faster supply chain. What made you come to Seedcamp for investment? That was an easy decision. We have known Seedcamp for years and we were aware of the reputation, especially in fintech. We had a first meeting and the way Sia, Carlos, and the rest of the team thought about our product and long-term vision was different from most other investors we had met and way more interesting. We realized very quickly the value Seedcamp could bring. Can you tell me a great book you’ve read recently? I’m currently reading The Three-Body Trilogy (The Three-Body Problem, The Dark Forest, Death’s End), by Liu Cixin. If I weren’t building a startup I would have dropped everything else to just read it. If you’re an early-stage founder looking for the best possible investment partners to help you as you scale then we want to hear from you! Let us know what you’re building right here.